Participating faculty will identify a particular assignment that already exists (or possibly design a new assignment) that allows for a learning through service (L-S) optional assignment. Students who choose to do an Agape assignment in a particular course will notify the professor and substitute an L-S option for the normal required assignment. This is a growing list of courses, so other options may become available. Typically, the professor offers an Agape assignment as an option, but occasionally it is *required. Be sure to check the course schedule each semester to confirm availability. The FA 2017 schedule is under development and is not the final released version. Students should not use this for course planning. *This course is limited to students in the Accelerated Advanced Standing program. Email registrar@dts.edu to register. A study of key practices and passages related to Practical Theology and Hermeneutics, with discussion on research procedures. Enrollment is limited to students in the Accelerated Advanced Standing program and requires the consent of the Advanced Standing Committee. A select exposition of the Old Testament books, with emphasis on critical issues, biblical theology, genre, and application. Enrollment is limited to students in the Accelerated Advanced Standing program and requires the consent of the Advanced Standing Committee. Prerequisite or Corequisite: AS101 Seminar on Practical Theology, Hermeneutics, and Research for ThM Students and BE101 Bible Study Methods and Hermeneutics for MA students. *This course is limited to students in the Accelerated Advanced Standing program email registrar@dts.edu to register. A biblical, historical, and systematic study of the seminal issues in trinitarianism, angelology, anthropology, and hamartiology. Enrollment is limited to students in the Accelerated Advanced Standing program and requires the consent of the Advanced Standing Committee. Prerequisite: ST101 Theological Method and Bibliology. An introduction to inductive Bible study involving the steps of observation, interpretation (hermeneutics), application, and correlation. Principles in these steps are applied to several biblical passages and books. Required prerequisite or corequisite to all Bible Exposition courses. *Hybrid sections have online and classroom instruction and run the full length of the semester. An exposition of Genesis, Exodus, Leviticus, Numbers, Deuteronomy, Joshua, and Judges with emphasis on the biblical theology of these books, their genre, and application. Prerequisite or Corequisite: BE101 Bible Study Methods and Hermeneutics. 3 hours. *Hybris sections have online and classroom instruction and run the full length of the semester. An exposition of the historical books (1 Samuel through Esther), Job, Proverbs, Ecclesiastes, and Song of Solomon with emphasis on the biblical theology of these books, their genre, and application. Prerequisite or Corequisite: BE101 Bible Study Methods and Hermeneutics. Recommended Prerequisite: BE102 Old Testament History I. 2 hours. *Hybrid courses have online and classroom instruction and run the full length of the semester. *Hybrid courses have online and classroom instruction. *This section will be taught in The Woodlands, TX. An exposition of Acts and 10 of the Pauline Epistles (all except Romans, Ephesians, and Philippians), with emphasis on the biblical theology of these books, their genre, and application. Prerequisite or Corequisite: BE101 Bible Study Methods and Hermeneutics and BE105 The Gospels. An exposition of Hebrews, James, 1 and 2 Peter, 1, 2, and 3 John, Jude, and Revelation with emphasis on the biblical theology of these books, their genre, and application. Prerequisite or Corequisite: BE101 Bible Study Methods and Hermeneutics. An exposition of Ruth, Psalms, Jonah, and three of Paul' epistles (Romans, Ephesians, and Philippians) that are not taught in the other required Bible courses, with emphasis on the biblical theology of these books, their genre, and application. This course is required for M.A. students and is an elective for Th.M. students. Prerequisite or Corequisite: BE101 Bible Study Methods and Hermeneutics. Recommended Prerequisites: BE102 Old Testament History I and BE104 Old Testament Prophets. An exposition of the biblical narrative of Scripture from Genesis to Revelation with emphasis on the relationships between the content of all sixty-six books of the Bible and the unity of what God is doing and saying throughout the entirety of canonical and biblical history. *Hybrid sections have an online and classroom instruction. An analytical study of the Gospel of John with attention to John's thematic presentation of the Son of God. An analytical study of Daniel and Revelation, with consideration of the many questions of interpretation and application in these important prophetic books. *Meets by remote video with Dallas Classroom section A. Not available to students in the Dallas area. Participation in RV sections requires internet bandwith of 1.5mb uplink and dowlink. A thematic study of the unfolding of the theocratic kingdom program throughout the Scriptures, tracing its origin, historical development in various forms, and its ultimate consummation in the reign of Christ, together with a study of the biblical covenants in relation to the kingdom. A thematic study of the earthly life of Christ, tracing in detail the movements of His presentation, authentication, opposition, and rejection. A biblical-theological study of themes related to the Lord' supper and an exposition of major New Testament passages dealing with the Lord' Supper. The course will review the contributions of the Levitical sacrifices, the Hallel Psalms, Isaiah' Servant Songs, and New Covenant passages, as well as explore the contribution of cultural issues to the understanding of the Lord' Supper. *Meets by remote video with Dallas classroom section A. Not available to students in the Dallas area. Participation in RV sections requires internet bandwidth of 1.5mb uplink and downlink. A study of the biblical meanings and purposes of suffering, with theological reflections and application to various aspects of suffering and disability-related ministries. The course includes a number of guest lecturers, including Joni Eareckson Tada. May also be credited in the Department of Biblical Counseling (See BC547). A course designed to consider the special issues associated with the theory, practice, and administration of counseling in pastoral contexts. Students will receive training for certification in the PREPARE-ENRICHÂ© and CounselaidÂ® assessments as well as the Strategic Pastoral Counseling model. An introduction to the foundations of Christian counseling, emphasizing the priority of a theological system for theory and practice. Special attention is given to models of integration, historical developments, current directions, and collaborative models of Christian counseling for the local church and the professional Christian counselor. A course designed to provide an introduction to primary counseling theories, with special attention given to evaluating those theories on the basis of Scripture, understanding the nature of men and women, observing how and why problems develop, and dealing with those problems in appropriate and effective ways. A course designed to trace the normal stages and understand the natural processes of human growth and development (from before birth to old age) on various levels: physical, intellectual, relational, and emotional. A study of the major techniques and strategies that can be appropriately and effectively used in counseling individuals, including ways of determining and defining problems (diagnosis) as well as helping with the problem (treatment). Prerequisite: BC210 Counseling Theory. A course designed to study the symptoms and underlying personal and interpersonal dynamics of the major categories of dysfunction as found in the DSM manual. Special attention will be given to depressive, obsessive-compulsive, and sexual disorders. Prerequisite: BC210 Counseling Theory. A survey of theories, issues, and informational sources associated with educational choices, career options, and vocational decisions that will enable the counselor to assist clients with vocational guidance and healthy lifestyle choices. A study of cultural and cross-cultural issues related to counseling. The course will investigate society and the church in terms of the role of women, ethnic groups, lifestyle traditions and change, population patterns, and counseling on the mission field. A study of statistics (principles, usefulness, and limitations) and other standard research tools and methods as applied in the field of counseling. This course will review basic principles of pharmacology with attention to the various medications given in the field of mental health. Students will learn mechanisms, indications, side-effects, and adverse reactions of important psychiatric medications. Prior instruction in biology, cell biology, or neurobiology is helpful but not required. An introduction to the family-system approach to intervention, which integrates marital, sibling, and individual subsystems, as well as family-of- origin and external societal influences. Biblical perspectives, clinical diagnosis, and treatment strategies are emphasized. An examination of group purpose, membership, stages and process, including the leader' role and leadership competencies. Emphasis is placed on small-group experience and its application both professionally and ministerially. A course designed to introduce the practices, processes, and procedures involved in counseling based on the theory and practice taught in BC210 Counseling Theory. Direct interaction in 20 1-hour individual counseling sessions with a supervised LPC intern helps develop studentsâ understanding of and ability to address common problems that people face. Students enrolling in this course will be assessed a $100 student counseling fee to help defray the costs of the individual counseling sessions. Prerequisite: BC210 Counseling Theory (must be taken previously or concurrently with this practicum). Enrollment limited to 12 students per section. Open to students who are not in the M.A. in Biblical Counseling program. A course designed for students to experience, observe, and apply in practice counseling theory, methods, and techniques at an off-site location, while under supervision (10 hours per week). Includes supervision and evaluation from professor, as well as interactive feedback from professor and students within an on-site, group practicum context. Students present a minimum of three videotaped counseling experiences, supplemented with a case summary. Emphasis is placed on diagnosis, treatment plan, and biblical integration. Prerequisites: BC305 Counseling Practicum I, BC215 Normal Human Growth, BC220 Counseling Methods and Techniques, and BC225 Abnormal Human Behavior (the latter two must be taken previously or concurrent with this practicum). Enrollment limited to eight students and requires consent of the professor. A course designed as a continuation of Practicum II with greater emphasis on comprehensive clinical definition carefully written in accordance with the standards of the profession. Students present a minimum of three videotaped counseling experiences, supplemented with a case summary. Prerequisite: BC310 Counseling Practicum II. Enrollment limited to eight students and requires consent of the professor. The counseling practicum elective is a continuation of Practicum III with a greater emphasis on careful clinical practice according to the standards of the profession. The course will require a supervisory relationship between a counseling professor and M.A./BC student working to accrue additional practicum hours. The student will be supervised as he or she experiences, observes, and practices the application of counseling techniques at an off-site location. Enrollment requires consent of the professor. A course designed to introduce the major theories of play therapy, help the student develop an approach to play therapy, increase the student's understanding of children and the child's natural language of play, and help the student learn the essential skills of play therapy. Biblical foundations of play therapy will be considered. This course examines selected aspects of death, including the dying person' needs, palliative care, legal arrangements, bereavement issues, and personal and cultural differences in grieving. Difficult spiritual questions and the scriptural responses are discussed. Examines the findings of research on family dynamics and provides certification and training for the Prepare/Enrich Inventory for couple and family assessments. May also be credited in the Department of Christian Education (see CE505â4). A study of the biblical meanings and purposes of suffering, with theological reflections and application to various aspects of suffering and disability-related ministries. The course includes a number of guest lecturers, including Joni Eareckson Tada. May also be credited in the Department of Bible Exposition (See BE547). A study of the educational ministry of the local church, with attention to aims, principles, leadership, organization, and agencies of a biblical program for all age-groups. Enrollment limited to 40 students. A survey of the history of religious education from Old Testament times to the present and a study of theories of Christian education with emphasis on developing a biblical philosophy of education. A study of spiritual dynamics in effective Bible teaching and principles of learning and teaching, with practice in using creative classroom methods in an actual teaching experience. Prerequisite: BE101 Bible Study Methods and Hermeneutics. Corequisite: EML104 Audiovisual Presentations. Enrollment limited to 40 students. 2 hours. A hands-on exploration of speaker-support media for face-to-face teaching, with emphasis on clear communication and aesthetic design. May also be credit in the Department of Media Arts and Worship (see MW404). A study of spiritual dynamics in effective Bible teaching and principles of learning and teaching, with practice in using creative classroom methods in an actual teaching experience. A hands-on exploration of speaker-support media for face-to-face teaching, with emphasis on clear communication and aesthetic design. This course integrates the requirements for EML103 Teaching Process and EML104 Media Presentations, and is offered at the Seminary's extension locations in place of EML103 and EML104. Prerequisite: BE101 Bible Study Methods and Hermeneutics. 3 hours. The examination and practice of communication skills in small-group settings with emphasis on exercises that enhance those skills. Current small-group ministry models will be reviewed. Enrollment limited to 20 students. An analysis of the qualities and practices of the effective Christian leader based on principles in Scripture and related literature, with attention to devising a personal philosophy of Christian leadership. A study of the dynamics of leadership development in both the leader's own life and in the ministry organization. This course will provide strategies and practices for the continued development of the ministry leader and for growth of new leaders for the church or ministry organization. A course designed to assess and define a person's ministry strengths and weaknesses and to develop leadership and interpersonal skills for more effective ministry, for the purpose of building confidence in future ministry decisions and developing vision. Limited enrollment. A study of principles and procedures that relate to leadership in a team environment. This course will focus on the essential elements necessary for effective teamwork on ministry leadership teams in church and parachurch settings. A course designed to train ministry leaders in how to plan strategically. The focus is on the four-fold process of developing a ministry organization's mission and vision, discovering its core values and designing a strategy to accomplish the mission and vision. A study of change and conflict in the context of Christian ministry. Increased understanding and skill development in change agency, conflict resolution/management, and handling of criticism are intended outcomes for each student. This course will explore the biblical rationale for faith development within the family from birth through age 12 and will present models where partnerships are taking place between families and churches in the spiritual development of children. Students will be provided with opportunities to learn from guest speakers and participate in field trips. *Meets by remote video with Dallas classroom section A. Not available to students in the Dallas area. Participation in RV sections require internet bandwidth of 1.5mb uplink and downlink. A study of the nature and needs of young people and objectives and methods of Christian education for youth. Group dynamics and discussion of practical problems and issues related to youth work are also discussed. Students will develop a working philosophy of youth ministry. A study of the unique needs of women and how to best teach, lead, mentor, shepherd, and care for women in local church, para-church, academic, and cross-cultural missions contexts. Examines both Old and New Testament passages that establish the foundation for a dynamic Christian marriage. Looks at issues and responsibilities that affect the nurturing and enriching of a Christian family. Examines the findings of research on family dynamics and provides certification and training for the Prepare/Enrich Inventory for couple and family assessments. May also be credited in the department of Biblical Counseling (see BC505-4). From candidating to ministry development, this course will enable the student to be effective from the first day in ministry. Key program issues will include recruiting, training, and working with professional staff. A comprehensive approach to evaluating various church ministries will be developed. Weddings, funerals, and baptismal services will be discussed. Field trips to various local ministry organizations provide opportunities for practical experience in weddings, funerals, baptism, camping, hospital visitation, and homeless ministry. The study of the philosophy and methodology of disciple development, based on selected portions of the New Testament, especially the life of Christ. Supervised field-based education in the student's intended vocational ministry context, under the supervision and encouragement of and experienced on-site Ministry Mentor. This contextual education experience consists of instruction, cohort interaction, and practical application in selected ministry settings in the Dallas area, across the United States, or around the world. This intensive learning opportunity is designed as an 8-month residency (two consecutive semesters-- Ministry Residencey I and Ministry Residency II) with an approved church or parachurch/mission organization during a student's studies. Prerequisite: Satisfactory completion of half the student's degree program. Independent research and writing of an applied research project on an approved topic under the supervision of a faculty advisor and an approved second reader who may be a faculty member or an approved ministry practitioner. Enrollment requires consent of the department. A study of Christianity from the second century to the rise of the Enlightenment with special emphasis on the institutional history of the church as well as theological developments in the church. A study of Christianity in Europe and America since the rise of the Enlightenment with emphasis on the numerous influences that have forged the current religious scene. A study of the historical development of selected doctrines, with attention to the development of each theological theme from the church fathers to the present day. A study of the writings of the Apostolic Fathers in their historical contexts, with an emphasis on their importance to biblical, theological, and historical studies. A study of the development of Reformation thought in relation to the political, social, and religious issues of the times, with particular attention to the biblical exegesis and theology of representative reformers. Supervised field-based education in the student's intended vocational ministry context, under the supervision and encouragement of an experienced ministry mentor. Enrollment limited to Th.M. students. Prerequisites: Satisfactory completion of 60 hours, including PM103 Expository Preaching I or an approved communication course and SF100 Spiritual Formation. Supervised field-based education in cross-cultural church planting or church nurture in a foreign country or in the United States, under the supervision and encouragement of an experienced ministry mentor. Enrollment limited to M.A./CM students. Prerequisites: Satisfactory completion of 30 hours, including WM205 Cultural Dynamics in Ministry and progress toward completion of SF100 Spritual Formation. Supervised field-based education in the student's intended vocational ministry context, under supervision and encouragement of an experienced ministry mentor. Enrollment limited to M.A./CL students. Prerequisite: Satisfactory completion of 30 hours, including EML305 Dynamics of Christian Leadership and progress toward completion of SF100 Spiritual Formation. Supervised field-based education in one or more forms of Christian education ministry and educational leadership, under the supervision and encouragement of an experienced ministry mentor. Enrollment limited to M.A./CE students. 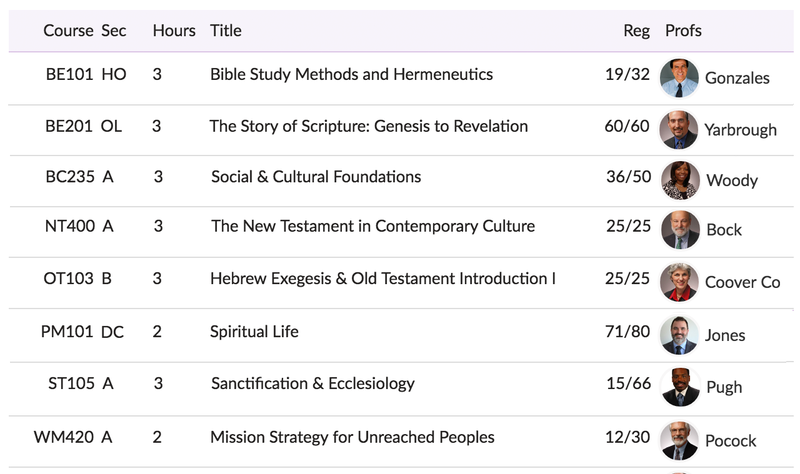 Prerequisites: Satisfactory completion of 30 hours, including EML102 History and Philosophy of Christian Education and progress toward completion of SF100 Spiritual Formation. Supervised field-based education in the student's intended vocational minstry context, under supervision and encouragement of an experienced ministry mentor. Enrollment limited to STM students. Supervised field-based education in cross-cultural TESOL classroom situations in a foreign country or the United States, under the supervision and encouragement of an experienced ministry mentor. Enrollment limited to TESOL Certificate students. Prerequisite: WM615 Methodology and Practice of TESOL. Supervised field-based education in the student.s intended vocational ministry context, under the supervision and encouragement of an experienced ministry mentor. Enrollment requires consent of the department. Prerequisite: INT105 ThM Ministry Formation Internship. Supervised field-based education in the student's intended vocational minstry context, under supervision of approved field observers. Enrollment limited to M.A./BS students. Prerequisites: Satisfactory completion of 30 hours, including PM102 and progress toward completing SF100 Spiritual Formation. A biblical, theological, and worshipful introduction to the imagination and creativity. This course provides a cursory history of the church's relationship with the arts, explores a theology of beauty, and seeks to develop a spiritual discipline of creative response to God's truth and beauty in students' particular areas of art and/or worship. A supervised, field-based apprenticeship, comprising the development and enhancement of media-related communication skills and/or worship design and implementation in a ministry context. Disciplines may include, but are not limited to, writing, acting, audio production, and video and film production, as well as worship design and implementation. Students will construct a professional portfolio as part of the apprenticeship. Enrollment is limited to MA/MW and ThM Media Arts emphasis students. Students must complete 30 credit hours of DTS coursework before enrolling in MW102. A study of the principles and techniques of effective writing, designed to prepare students for writing in the Christian field. Students will write and read their own material in class as well as edit and critique the writing of their fellow students. Enrollment limited to 15 students. *This section meets by live streaming video. Only available to students outside of the Dallas campus area. An examination of selected fictional and nonfictional writings of C. S. Lewis and J. R. R. Tolkien, which illustrate and describe the creation of imaginary worlds. The student will read and interact with a variety of essays, correspondence, and fictional works by Lewis and Tolkien and reflect on how experience of these fictional worlds enables the reader to grow in moral virtue by refining one' ability to discern between good and evil. A hands-on exploration of speaker-support media for face-to-face teaching, with emphasis on clear communication and aesthetic design. May also be credited in the Department of Educational Ministries and Leadership (see EML104). A course designed to improve studentsâ vocal and physical delivery through dramatic presentations of Scripture. The course emphasizes character and scene analysis, blocking, acting theory, and presentation. Enrollment limited to 15 students during the fall and spring, and 10 students in the summer. A study of the basic principles of biblical Greek, for students who have not had Greek or who need an extensive review in the elements of the language. One section each of NT101 and NT102 will be an honors Greek Section. The purpose of honors Greek is to gain greater facility in the Greek language as a preparation for more thorough exegesis in the New Testament. Besides the standard requirements for NT101-NT102, honors Greek will focus on increased vocabulary and composition from English to Greek. No previous study of Greek is required. *Section H is an Honors Section. See syllabus for details. A study of the grammar and syntax of the Greek New Testament, and an introduction to New Testament textual criticism. Prerequisite: NT101-NT102 Elements of Greek or a satisfactory score on the advanced standing exam. An introduction to exegetical procedures and practice of exegesis in various New Testament genres with an emphasis on Ephesians. Procedures include outlining the argument of passages, doing word studies, validating exegetical decisions, and using exegetical tools properly. Prerequisite: NT103 Intermediate Greek or a satisfactory score on the advanced standing exam. An exegetical study of Romans, emphasizing the theological content and development of the book. Prerequisite: NT104 Introduction to New Testament Exegesis. A study of the historical background and canon of the New Testament, an evaluation of New Testament criticism, and an examination of special introductory problems of selected New Testament books. The student will become acquainted with first-century works and issues as well as interact with the contemporary debates that directly relate to the origins of Christianity. Students may substitute NT400 The New Testament in Contemporary Culture for NT113 but may only take one or the other. 2 hours. An examination of New Testament biblical introduction that interacts with key issues about the Bible in the public square and university contexts. This course will engage in discussion of contemporary issues about the origins of the Jesus tradition, the apostolic teaching, the New Testament as a canon, and the origins of Christian orthodoxy as seen in the New Testament and important collateral writings of the period. Attention will be given to major first-century cultural features, both Jewish and Greco-Roman, that serve as a backdrop for the original Christian message leading to a greater appreciation of the New Testament message. The course will also treat how such issues impact one' understanding of scripture as inspired by God. Students may substitute NT400 the New Testament in Contemporary Culture for NT113 but may only take one or the other. Prerequisite: ST101 Introduction to Theology. A study of the backgrounds to the ministry of Christ, a survey of His ministry in the Gospels with primary focus on the Synoptics, and consideration of how to study the Gospels. Special attention will be given to evaluation of recent critical discussions of the life of Christ, including such topics as the quest for the historical Jesus and the Jesus Seminar. *Meets by remote video with Dallas Classroom Section A. Not available to students in the Dallas area. Participation in RV sections requires internet bandwith of 1.5mb uplink and downlink. An examination of the history, method, and approach of Historical Jesus studies to Jesus' life in general and to specific key events in Jesus' ministry. The student will be equipped to interact with current discussion and debate on the Historical Jesus and to understand the ways in which such discussion and debate are undertaken. A critical survey and exploration of ancient literature to give the student exposure to a wide variety of ancient literary sources, with a focus on methodology and specific texts that have significance for New Testament exegesis. An introduction to the basic principles of Hebrew phonology and morphology. A study of Hebrew morphology and syntax as well as an introduction to text criticism and to the basic tools and methods of lexical analysis. Includes translation of the Book of Jonah, with lexical analysis of key words and syntactical analysis of selected forms, phrases, and clauses. An introduction to the exegesis of Hebrew narrative and poetry, including a review of Hebrew morphology, syntax, and lexical analysis in conjunction with translation of the Book of Ruth and the exegesis of selected Psalms. Prerequisite: NT101-102 Elements of Greek, OT101 Elements of Hebrew I, and OT102 Elements of Hebrew II or a satisfactory score on the advanced-standing exams. An inductive and deductive study of biblical Hebrew from the perspective of its historical development within the Semitic family of languages. Prerequisite: ThM students will seek consent of Dr. Taylor, who will decide whether they are ready for this course based on their prior work in Hebrew at the master' level. Enrollment requires consent of professor. Studies in selected portions of the Old Testament to improve the student's ability to read Hebrew, emphasizing morphology, vocabulary, and syntactical recognition. Required of students with an Old Testament concentration in the Academic Ministries track or Interdisciplinary Studies track. Prerequisite: OT101 Introduction to Old Testament Language and Literature and OT102 Elements of Hebrew. An exegetical study of the Book of Leviticus with attention to the fundamental theological issues in the book and on preparation for teaching and preaching the book. *Meets by remote video with Dallas Classroom section A. Not available to students in the Dallas area. Participation in the RV sections requires internet bandwidth of 1.5mb uplink and downlink. A study of divine names, titles, roles, attributes, and acts/self-revelation with a view to their relevance for Christian theology, worship, and ethics. The course will also compare and contrast Israelite monotheism with ancient Near Eastern polytheism in an effort to help the student appreciate the unique revelatory nature of Israel's religion. A study of the biblical principles that govern true Christian character and service, with emphasis on the sufficiency of the divine provisions and the heart conditions necessary for holy living and spiritual power in ministry. An introduction to basic expository preaching theory and skills, emphasizing the preparation and delivery of a textually derived proposition with accuracy, interest, clarity, and relevance. Students preach twice and receive evaluation from fellow students and the professor. Prerequisite: BE101 Bible Study Methods and Hermeneutics. Enrollment limited to 12 students. Instruction in narrative preaching, with attention to theological development, sermon structure, oral clarity, the public reading of Scriptures, and long-term sermon development. Students preach twice and receive evaluation from fellow students and the professor. Prerequisites:PM103 Expository Preaching I. Enrollment limited to 12 students. *This section open to men only. *PM105 should only be taken by students who entered DTS in the fall 2017 or later. A study of biblical principles and practices that govern true Christian life, from its inception to its destiny, with emphasis on the Mission of God, the sufficiency of divine provisions, and the heart condition necessary for conversion, holy living, and evangelism. Instruction in preaching the Psalms and Old Testament prophetic passages. Students preach three times, including a 'portfolio sermon,' and develop a preaching calendar. Required of all students in the Homiletics emphasis. Prerequisites: PM104 Expository Preaching II and OT103 Hebrew Exegesis. Enrollment limited to 12 students. *Section open to men only. Section meets by video with PM252VC section. Instruction in preaching topical expository sermons. Students preach three topical expository sermons and write a research paper. Prerequisite: PM104 Expository Preaching II. Enrollment limited to 14 students. *Open to men only. Meets on the Houston campus via video with Dallas section N.
*Meets via video with the PM301VC section. *Meets on the Houston Campus via video with Dallas section A. Skill development in the preparation and leadership of corporate worship experiences and pastoral care. The student will survey biblical and historical models, explore the nature, significance and use of music, the ordinances, and other pastoral duties. The student will also lead experiences of worship and pastoral care in the class. A study of biblical foundations for roles of women in the church. The course is designed to aid both men and women who will be responsible for various areas of ministry. May also be credited in the Department of Christian Education. *Meets by remote video with Dallas campus section A. Not available to students in the Dallas area. Participation in RV sections requires internet bandwidth of 1.5mb uplink and downlink. A study of pastoral ethics, counseling, and ministry in the current health-care environment, including issues created by research strategies, reproductive technologies, eugenics, end-of- life decisions, and directions in public policy. May also be credited in the Department of Theological Studies or the Department of Biblical Counseling. This course prepares international students for academic success through instruction on the research process, research strategies, thesis topic selection, formatting, academic cultural differences, computerized databases, and bibliographic resources. Attention is given to research writing, communication, documentation, and cultural adaptation. The course is required for incoming international students and is a substitute for RS101 Orientation and Research Methods. This course is designed to guide students in the use of library materials, computerized databases, and bibliographic resources. It provides instruction in research strategies, thesis-topic selection, and familiarization with form and style for papers and theses. In addition, this course provides an orientation to the educational philosophy of biblical, theological, and ministry-related studies at DTS. *Hybrid sections have online and the full length of the semester. The seminar provides guidance for advanced research methods and an opportunity for writing a summative research paper within the ThM degree program. Prerequisite: Satisfactory completion of 90 hours in the ThM program. This course will guide the student in the selection and writing of a research project on an approved topic under the supervision of a faculty advisor and an approved second reader. *This is a DC campus section for Men's groups. Groups to be formed after Registration closes. Days and time to be reviewed based on groups. *This is a DC campus section for women's groups. Groups to be formed after registration closes. Days and times to be reviewed based on groups. *Sections H1-H4 are open to women only. Sections H5-H8 are open to men only. Section HC is open to married couples only. This is a Houston section. *Sections H1-H4 are open to women only. Sections H5-H8 are open to men only. Section HC is open to married couples only. This is a Houston section. This section is for students who are unable to attend a 4:30 to 5:45 PM SF group. *Sections H5-H8 are open to men only. Sections H1-H4 are open to women only. Section HC is open to married couples only. This is a Houston section. This course challenges students to grasp more fully the reality of our identity in Christ both personally and corporately. The Life Inventory Exercises are the primary resource used in discovering and establishing identity. An adequate understanding of one' identity in relation to God, self, the body of Christ, and the world is presented as a precursor to developing authentic community. This course must be taken concurrently with the first semester of SF100. This course challenges students to pursue new depths of trust out of a common commitment to discovering God' authorship in their lives. Life Story is the primary resource used in guiding each Spiritual Formation group toward the development of authentic community. This course must be taken concurrently with the second semester of SF100. This course challenges students to examine the personal and corporate implications of sin and grace in their lives. The Life Change Exercises are the primary resource used in developing integrity in the lives of group members. This course must be taken concurrently with the third semester of SF100. This course challenges students to implement their divine design in pursuing Christlikeness in every arena of life. The Vision and Fidelity Exercises are the primary resources used for exploring each member' vision for a continued life of fidelity in faith and practice. This course guides students through synthesizing the previous modules and considering the kind of life they want to live as a follower of Jesus Christ. This course must be taken concurrently with the fourth semester of SF100. A study of prolegomena as the nature, method, and sources of theology; revelation, especially the inspiration, authority, sufficiency, inerrancy, and canonicity of the Bible; and theological hermeneutics, including an introduction to dispensationalism. This course is prerequisite to all other Systematic Theology (ST) courses. *The live meetings will be held at Community Bible Church in San Antonio. Times and days TBD. *Hybrid sections have online and classroom instruction. *Hyrid sections have online and classroom instruction and run the full length of the semester. A study of the defense of Christianity with emphasis on the biblical and theological foundation, methodology, and contemporary challenges to the truth of Christianity. A survey of philosophical issues including the problems of God, evil, religious language, and religious experience, as they relate to theological issues. A study of the biblical meaning and purpose of missions, missions agencies and instruments, and missions accomplishments, trends, needs, and possibilities. *This section will be captured on video for online-class content. A consideration of the dimensions and manifestations of culture as they influence ministry with special attention given to specific skills for exegeting a cultural setting for ministry. The development and assessment of a theoretical model of intercultural communication and an exploration of communication strategies for creating understanding interculturally. A seminar-style study of the cultural, historical, and religious characteristics of ministry in Roman Catholic contexts and of the implications for ministry created by these characteristics. A study of worldviews that confront Christians in various cultures and of apologetic methodology useful in evangelizing different people groups in their own religions and cultures. May also be credited in the Department of Theological Studies. A study of how to understand and apply the Bible faithfully and effectively in changing global contexts. Attention is given to biblical and historical bases and an evangelical hermeneutic and methodology for contextualization. Each student develops a biblically controlled strategy for contextualization and applies that strategy to one issue needing to be addressed from a contextual perspective.